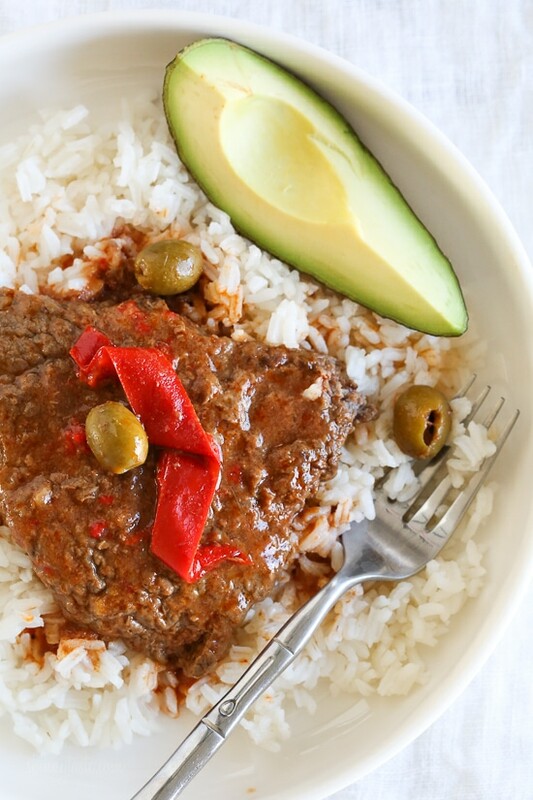 Braised Cubed Steak with Peppers, Onions and Olives is a flavorful, budget-friendly and family friendly dish you can make in the Instant Pot, Slow Cooker or in a pot on the stove. This is a dish I grew up eating, and always loved. It’s cheap because it’s made with an inexpensive cut of beef and just a few ingredients. 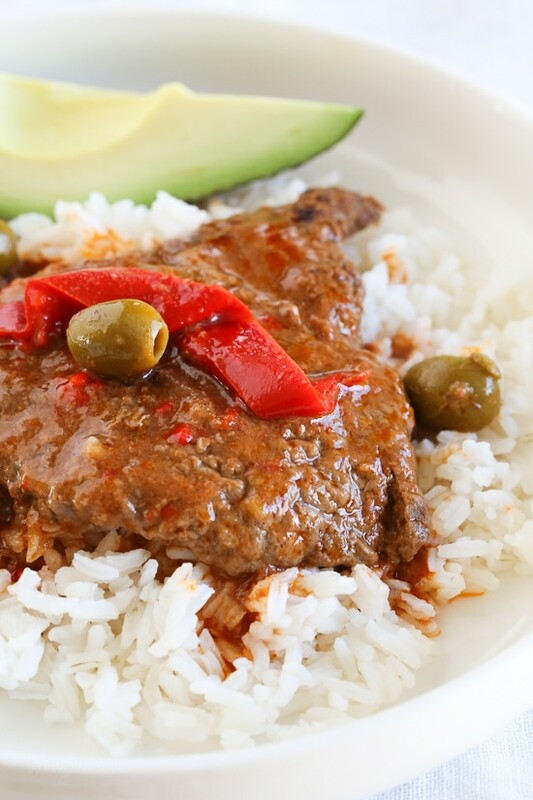 My Mom learned this recipe from her Cuban friend which she called Carne Machacada. I saw the cubed steak in the supermarket last week and craved this dish immediately so I called my mom to ask her how to make it and adapted it for the pressure cooker. She makes this on the stove which I have done many times before, but really loved how tender it came out in the Instant Pot. My family devoured this, even went back for seconds. I served it over rice with a quick slaw on the side. If you want an easy, budget-friendly, family-friendly dish with a Latin flair, I’m sure your family will enjoy it! This is freezer-friendly, to freeze store in a freezer safe container and let it thaw in the fridge the night before to reheat. Dairy-free, egg-free, gluten-free, whole30 and paleo-friendly. Great served over rice, or to keep it low-carb serve it over cauliflower rice. Place into the pressure cooker, top with onions and peppers, pour tomato sauce and water over everything and add the olives along with some of the brine (liquid from the jar). Cover and cook high pressure 25 minutes. Add a little more water and cook 1 hour, covered on low heat making sure there is enough liquid to cover. This is one of my favorite recipes!! If I want to double the recipe in the instant pot, do I need to adjust the cooking time? No, time is the same. Just made this dish. Fantastic. First cubed steak of my life that was actually fall-apart-on-the-fork tender. No knife required. Delicious. Thank you for a cubed steak recipe that Didn’t have brown gravy. cant wait to try do you brown the meat first or just put it in raw? Made this last night! The flavored had a good base, but I would make some changes next time: up the spice factor, a little tomato paste for depth, slightly longer cook time, and some cornstarch at the end for thickening (it was quite watery). Will try again! I made this with round steak. I used my pizza cutter to tenderize the meat. Cooked it in the slow cooker and it came out perfect. The meat was so tender it just fell apart. I used black olives and the flavor was great. Will definitely make this again. So easy. I am unable to find any pitted green olives except for queen sized one. All of the others are stuffed with pimento. Do you use the queen size for this dish? If not, can you direct me on where to find the correct type of olives? This dish looks delicious and I am eager to try it so I sure appreciate your help. Thanks! Yup, I use the ones stuffed with pimento. Just did the IP version. It was damn good! Totally hit the spot. I added about 1/2 a teaspoon beef better than Bullion and 1 clove garlic minced. The sauce was a little runny but I can probably easily fix that. Adding this to my repitoire. Super easy and quick as well. I really liked this recipe. Its similar in taste to a pepper steak I make. Its easier and WAYYYY less calories. I would dredge in flour and then fry/brown the meat in oil. I Love the set it and forget it of a crockpot recipe. Man, this was so good! I made with capers instead of olives for less fat. The Instant Pot retained the flavor beautifully! This is absolutely delicious and so easy! I was looking for a different cubed steak recipe, and this intrigued me. I used the “real” olives from an olive bar, and I added garlic (I add garlic to everything just about). It is a bit on the soupy side, so I cooked the rice a little less so it has room to soak up the sauce. Served with 1/2 cup of brown rice, this is my husband’s and my lunch for a week (four day). LOVE LOVE LOVE!!! This recipe, with a bit less meat (didn’t have quite the exact amount) lasted me Tuesday-Sunday- and I was eating it every night! Amazing flavor, and even better the next day! I did add a bit of red wine vinegar- unsure if that made a difference, but either way, a winning recipe!!! I don’t have a insta pot, but do have a a 60 yr old pressure cooker that still works great. would the cook times be the same with my old pot? Due to not being able to do tomato stuff I used pumpkin instead and it was GREAT! I cut back on the Adobe, but wish I hadn’t. Will add a bit more next time I make it. big flavor. So easy and tasty, especially the next day for lunch. Thanks Gina. I’m not a huge fan of olives…is this recipe good without? Made this in my fagor pressure cooker tonight. Only had green peppers, had white and red onion so used the red since peppers were green. No adobe seasoning but had chipitole peppers in adobe sauce so added 4 peppers with a little sauce. Used vegetable broth in place of the water same amount. Also, seasoned the meat with garlic powder. Made mashed potatoes for husband to take this meal with him to work. I had it with the riced cauliflower. Was fabulous! IF hubby don’t like it this will be one I still make to freeze portions for me as needed. So good! I would never have tried cubed steak if it weren’t for this recipe. This one is on regular rotation in our house; I serve over cauliflower rice for myself and regular rice for husband and toddler. HELP! I have the same question as Jonelle. Mine is the same. Do I put it on meat/stew or what? Excellent. Only modificationbid make is reduce water to 1/2 cup. It turned out a little to liquidy for my tastes. Thank you Gina for your delicious recipes,i have made many of your recipes and have used them a d still using to help me and my husband loose weight and it feels so good because your recipes are so flavorful which means we don’t miss our high calorie ones,thank you again. I would really want to make this recipe this evening but i don’t have green olives but have the black ones ,can i use that instead? I now have done this recipe with a pressure cooker and it was as ever bit as perfect as done in the slow cooker . What a wonderful recipe and such fun to use the pressure cooker and get excellent results. I do cook the broth down on the saute setting to thicken, I remove the meat first. Very good and a favorite recipe. Thank you. Ok thank you!! I don’t have an instant pot but will try the crock pot next time! I love all your recipes but I must have done something wrong! I cooked it on the stovetop for one hour covered on low heat, but the meat is tough and the sauce is watery. Help! Stove top , should I brown the meat and sautéed onion first ?! You don’t have to but you can, and yes on the amount. I made this tonight, the slow cooker version. I loathe olives, capers, and anything briny so I added about a teaspoon of vinegar to the sauce per someone’s recommendation. I was in a bit of a time crunch so I cooked it for four hours on high. It was perfect and delicious! I didn’t, and wouldn’t, change another thing, I served it over your puréed cauliflower mash and had mixed veggies on the side. I buy cube steak quite a bit, because it’s so economical, so this is definitely going into my regular rotation. The brine liquid…is that from the green olive jar? If not, can you explain this please? Thanks and look forward to trying this next week! Easy and very versatile recipe. I had no olives, so pepperocini and juice from the jar was my stand in. The meat was very tender. So good, and so quick. I made this last night and it was Fantastic!! My kids loved it!! Thanks Gina!! Have you noticed a difference in taste or tenderness of the meat in cooking in crock pot versus pressure cooker? Which green olives did you use? The Spanish olives in the jar? So delicious- i added some spinach/kale mixture to add my green veggies to the mix and it was muy bueno! I am W30 and this hits the spot after a long day! Can I cook this in the instant pot with my cube steak frozen? This was definitely a winner. Instead of fresh pepper and onion, I threw in a bag of the frozen grilled peppers and onions from TJ’s. I also thickened the sauce with a bit of cornstarch – next time I’ll reduce the water to about 1/3 of a cup. I made this in my pressure cooker tonight. I didn’t have cubed steak, so just used some cubed sirloin steak and accidently opened tomato paste instead of sauce, so I used that. Served over riced cauliflower. Very tasty. This was just ok, but I will probably cook in the crock-pot next time and maybe with another cut of meat. The cube steaks fell part in places, but at the same time, parts were a little tough. The final dish had way too much liquid. Even though we served over rice, there was still too much liquid, and not enough veggies. All the liquid kind of diluted the flavor (I did buy the special adobo seasoning and plenty of pepper). I think next time, a whole bell pepper, whole onion, maybe a different cut of meat and less liquid are in order. 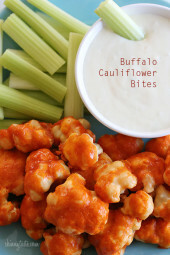 But there are actually many recipes on this site with very similar flavors, so maybe i won’t bother tweaking this one. I just found your website a few weeks ago and loved the balsamic chicken and veggies and the omelette muffins so I really wanted to love this as well. I made this for my lunches for this week and while the flavor of the sauce was good and the beef was fork tender it was so dry. Unfortunately I had to trash all of it but I understand that not all recipes are for everyone. I won’t give up on your recipes. I’m planning to make the sheet pan Italian chicken and veggies for next week’s lunches!! Could you start with frozen cube steak? If so, what time/pressure adjustments would I need to make using the Instant Pot? Thanks! I think so but haven’t tried. I made this recipe last night and I cooked it in a pot on top of the stove. I was a little nervous that the steak would be tough/chewy but it was not. It was tender and full of flavor. I added canned string beans to the pot about half way through. I’m not a big fan of rice so the cauliflower was perfect for me. I am definitely going to make this again! Maybe this is a silly question, but for preparing in the slow cooker, how much water would you add? Hi Gina! Avid Skinnytaste follower for the last 5 years…. my husband is Dominican so I make lots of spanish food… I made this 2 nights ago, and although it was delish, it just had so much liquid in the instant pot at the end. My hubby likes his sauce thick… do you think I could get away with just adding the tomato sauce and letting it cook, and the steam would make enough liquid to create a thicker sauce?? What are your thoughts? Thank you!! Love everything I’ve ever made! Sure, there should be at least 1 cup of liquid so as long as you have 1 cup sauce it should be fine. This recipe was a huge hit! My boyfriend loved it! I doubled the recipe so we would have leftovers throughout the week. I don’t have a slow cooker so I cooked this on the stove top for almost three hours which made the meat super tender and gave great flavors throughout. An hour wasn’t enough time. I also thickened the sauce by adding 2 tablespoons of flour (I would only add one if the recipe wasn’t doubled). One other adjustment was adding adobo seasoning and black pepper to the sauce (1 1/2teaspoons adobo and 1/2 teaspoon of black pepper). This gave the sauce a lot more flavor. Absolutely delicious. I will be making this again soon! Thanks Gina! This recipe didn’t turn out well for me. I followed it as written so I’m not sure what went wrong. It had a weird flavor and the meat was crumbly. I’ve had great success with your other recipes so I’ll keep trying! Hmmm, yea I didn’t think this was good. Followed directions to a T.
This recipe turned out well. We didn’t love it just because of the taste profile, but it wasn’t due to it being a bad recipe. If you love that sweet and sour taste that comes along with peppers and vinegar (olives), you’ll like it. It was quick and very simple to put together. Gina I loved this!! I have been meal prepping on Sundays for 2-3 dinners a week and this was a really easy way to prep a meal that my boyfriend was able to dump right in to the crockpot today while I was at work 🙂 I came home and served it with microwave brown rice and some fresh steamed green beans that I seasoned with lime and cilantro. This was a home run in my book!! Thanks for helping me keep it interesting as I diet! I did mine in the crockpot today…It doesn’t look as thick as your sauce..its thinner…any tips??? Oops! Just saw that you answered that question already. Thanks! I do not like olives but want to make this. Would it taste ok without? Nice recipe thanks for sharing this. I’ve been cooking recipes from Skinnytaste since 2012, and this is the first recipe I’ve tried that I didn’t like. I’d still say, that is a good track record! It was very tender out of the instant pot, but it didn’t much flavor. Thank you for the recipes! Sorry you didn’t enjoy this one Crystal! Not every recipe is for everyone. Thank you for your loyalty! I am going to try this again using the pressure cooker function on my Instant Pot. I followed the recipe to a T and cooked it on low for 8 hours in my Instant Pot. It came out really dry and not tender at all. I was disappointed to have to chuck it. 8 hours in the slow cooker? This was amazing! Thank you. It’s exciting that cube steak is so low in points. We made this yesterday in the crockpot. It was very tasty, but the meat was dry, which is weird after such a long time slow cooking. That being said, we never cook cube steak, though. I think we’ll make it with top round or top sirloin next time instead, unless you can give us an idea of where we went wrong. Thanks for your great recipes! Yes, it’s a bit different than regular steak. It’s most tender in the pressure cooker as the flavor gets into the meat. Made these for dinner today!! Excellent…the recipe is a keeper! Can I cook this in the stow cooker for 4 hrs. HIGH rather than 8 hrs LOW? I meant slow cooker* oops! I made this yesterday in the slow cooker and it was a success. So easy and so good. How would you adapt this for the crock pot? Gina, I know you’ll think we’re crazy but our family doesn’t really care for olives. Any alternatives? I know it will change the taste of the dish but ….we just can’t do the olives. Thanks! I’m so excited to try this week! I love all of your recipes….my husband and teenage daughters do too!!! Thank you, thank you, thank you for changing the way I cook….and for so many Instant Pot friendly recipes!! Another Skinnytaste hit. My daughter really liked it even with the olives in it. Excellent preparation for cube steak. the long braising in crock pot made it perfectly tender. I had 5 large cube steaks and cut them in two for my 28 ounces. so I adjusted calories for slightly smaller portions for 10 for calculation purposes. Lots of liquid in this, could reduce if want to but good as is with rice or cauliflower rice. Will make frequently. Easy, and not spicy at all with adobo seasoning, just gives whole dish nice underlying flavor. Made this for friends an family get together this past Friday. 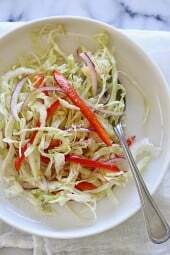 Along with the suggested fried rice, an Cole slaw. Was a huge hit! Still no one, an I mean no one, still doesn’t know that the fried rice really wasn’t RICE. Comments from everyone was when will have this again? Thank you for sharing the recipes. I made this for dinner last night and it was a hit. Could you add the cooking instructions for stove top? I wasn’t sure how long/what temp. I winged it but possibly lower/slower would have been better than how I cooked it. The directions are there, one hour low heat, covered. I made this tonight and it was really yummy! The hubs said, we should make this more often…which is a huge compliment. I used the garlic salt instead of the adobo seasoning, but I’m going for the adobo next time. Thanks for all the recipes that have made me and my family happy. This is on the menu for this week! When I put the info in the WW calculator, it came out to 3 SP. did I miss something??? Recipe builder is the only way to get accurate smart points, the calculator is adding points for the tomato sauce. Would the cook time be different for an 8 qt instant pot? What’s the release method for the instant pot? never mind it’s natural release. 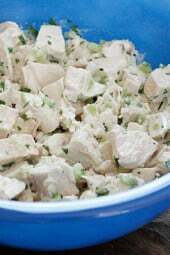 A Cuban friend of mine use to make this on stove…I think she added vinegar….Have you heard of that??? I believe vinegar is used to hep tenderize the meat. I imagine the brine from olives is made with vinegar. This looks delicious! Could I add beef/chicken stock instead of water? And, I was looking for a recipe for cubed steak……thank you! My husband is Puerto Rican, and his mom makes a similar dish, just no red peppers. I am doing a Whole30, so I will give this a go. I could use a crock pot meal at this point! How long should I cook this in a crock pot? Hey Gina, would cooking this on high instead of low in the crockpot work? If so, how long would you recommend? This looks amazing! What would you suggest to substitute cube steak as we don’t get that here in the UK. Thanks! Cube steak is made from top round or top sirloin. Hope that helps Lesa! If you are using a slow cooker, would you cook on high for 4 hours? What brand of Adobo seasoning do you use? Made your Whipped Parmesan Cauliflower Puree last night…. don’t know if I will ever need to eat mashed potatoes again. Very delicious!! I am certain you have addressed this before and I just can’t find it, but is there a particular instant pot you like? I am in the middle of a kitchen remodel and without a stove and I think that might be a great option. The crock pot is great, but sometimes, when I have to leave for work at 7:30, I just can’t get it all together enough to have the crock pot going. The instant pot might save us from a lot of carryout! Thanks! Thanks! It’s ordred. God bless Amazon Prime! What would be the best cut of steak for this? Thanks! I haven’t made one of your recupes I didn’t like! ???? Top round or top sirloin. 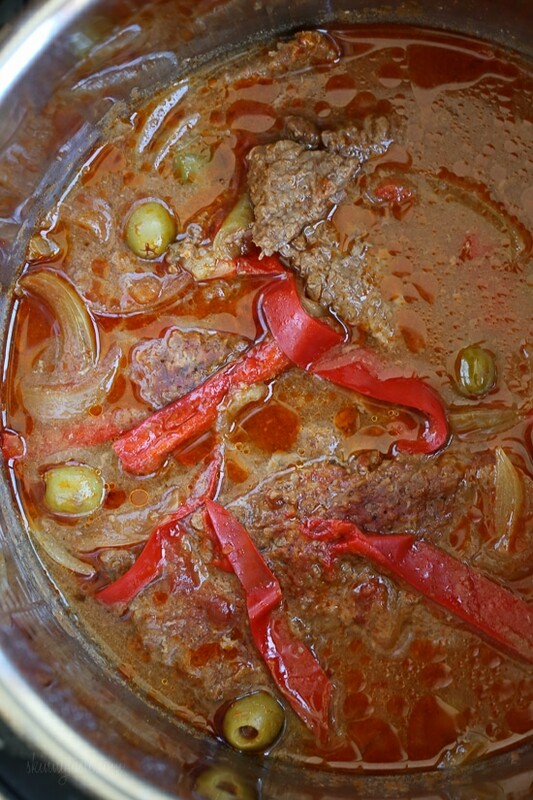 My abuela calls this bistec en cazuela! Excited to try this version! Could Kalamata olives be used in place of the green or would you suggest i go buy the green??!! Thanks! Is there another name for cube steak? Is it just cut up “cubed” stew meat, like chuck roast cut into cubes? I don’t think I have ever seen “cube steak” in my meat section. Thank you! Cube steak is top round or top sirloin, tenderized by a meat tenderizer, or an electric tenderizer. It gets it name because of the shape of the indentations left by that process. I’m so excited about this! Since I’ve been trying to be healthy, I haven’t made cube steak because I cooked mine in gravy. This recipe is totally do-able. AND I love the cauliflower rice suggestion! Thanks! What is a quick pot? I’m sorry, I think that’s what you called it. I think she is referring to Instant Pot, an electric pressure cooker, that is simply amazing. Hi Gina! What kind of steak is best used for this? Thank you! Any substitution suggestions for olives? Or would you just leave them out? Thanks! Thank you! What kind of vinegar, and about how much? This looks super tender but how easy is it to chew? The one I cook for needs meat to be very easy to chew. super easy and tender in the pressure cooker. It came out fall-apart tender in the slow cooker. We actually got up and put our knives back in the drawer. Cubed steak made this way was my grandmother’s favorite because it was so easy to chew! We made in the oven and cooked a bit longer, but I think this would be best in an instant pot! This looks yummy! I have my lunch for next week! My fiancé is Cuban and I’ve never been brave enough to try and make food like his mom used to, but this seems so easy that I think I might try and surprise him with it! Thanks for the great recipe! For [email protected] KITCHEN GENT–Don’t be afraid to try this recipe to feed a Cuban. It sounds exactly like my Cuban relatives’ recipe for Ropa Vieja. The only difference is that the Cuban recipe uses flank steak (way more expensive) and the Cuban recipe calls for shredding the flank steak which, of course, wouldn’t work with cubed steak. I’m eager to try it and will post when I do. I just joined weight watchers today. How would I enter this meal into my phone tracker? This recipe looks so amazing and easy! The easiest way is to do a “quick add”, hit the PLUS button then choose quick add. Type the name of the dish and the smart points. Another way is to put it in recipe builder (I cut and paste), but it takes a lot longer and I trust this site for the correct points. Just join Pinterest and add to a WW board…?